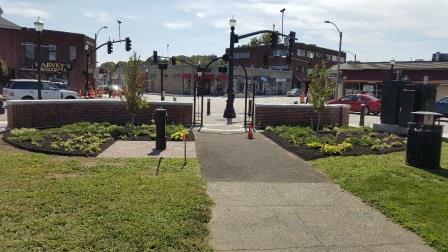 Phase I of the Downtown Streetscape Renovation Project is complete! 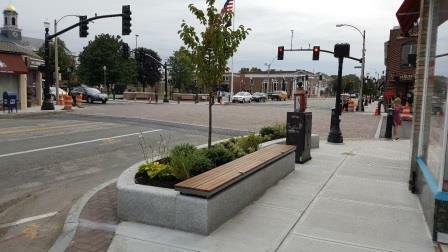 Thank you to everyone that attended the ribbon cutting ceremony, including: State Representative Denise Garlick, the Board of Selectman, staff from the Town Managers’ Office, the Department of Public Works, and the Needham Police Department, members of the Downtown Streetscape Committee and representatives and owners of local businesses. Special thanks to BETA Inc. and VHB for designing this project and to MDR Construction - for bringing the Town’s vision of “a gathering place” to life. 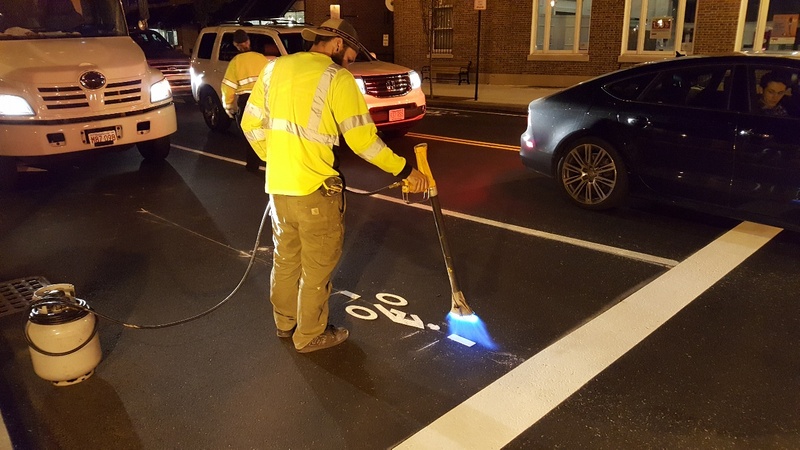 September 29, 2017 - Week 63: MDR's sub-contractor, Pavement Markings Inc. worked three nights this past week to complete line striping, traffic and parking symbols downtown. MDR's landscape sub-contractor, M.O.N. installed decorative mums in the center planter and around the flagpole. Next week MDR is scheduled to work on punch-list items, including cleaning up the bollards, light poles and mast arms. September 22, 2017 - Week 62: MDR and their two subcontractors (Dagle Electric & Pavement Markings) worked this week. Dagle Electric completed their work on the traffic loop detectors. Pavement Markings Inc. marked out lane lines, stop bars and symbols. They expect to return later this week, weather permitting, to paint the lines with reflectorized epoxy. MDR completed their installation of the remaining sidewalk pavers and polymeric sand. Next week, MDR will continue to work on punch-list items. 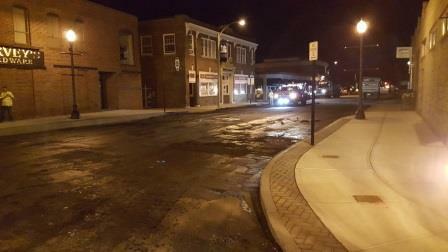 September 15, 2017 - Week 61: MDR's sub-contractor (D&R Paving) paved the the Downtown area this past Sunday night. MDR continued working on planter "C", the installation of the wood bench seat and pouring the remaining concrete sidewalks. Next week, MDR will complete the brick work in the sidewalk strips and decorative plants will be installed in the planters. 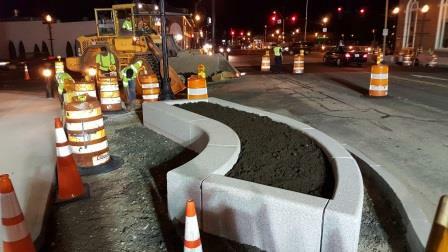 September 8, 2017 - Week 60: MDR worked during the day to install curbing on Dedham Ave. and installing planter "C". They also repaired sections of the milled roadway where the gravel sub-base was exposed and raised castings in preparation for next week's paving. Dagle Electric removed the remaining five old light poles from the Downtown area. 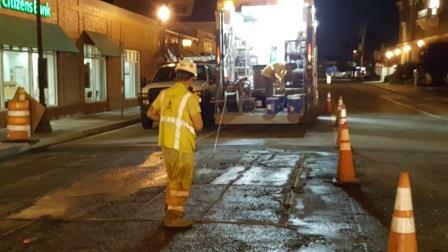 Dagle also had a night crew working throughout the week to install the traffic loop detectors. September 1, 2017 - Week 59: MDR had their two subcontractors working this week; Dagle Electric and Swank. Dagle Electric removed four of the nine old light poles. 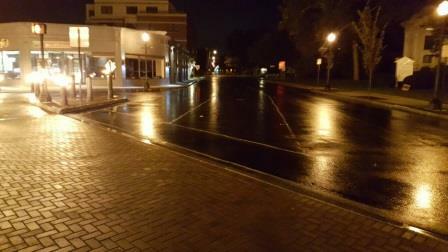 Swank completed milling throughout the Downtown area in preparation for final paving. Next week, MDR's daytime crew anticipates completing the sidewalk areas and planter "C" in the location where light poles have been removed. Dagle Electric anticipates removing remaining light poles during the day. 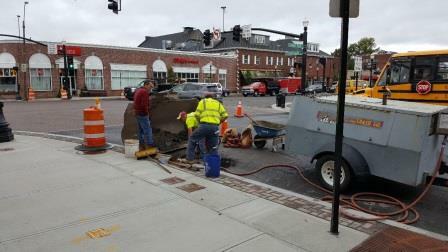 Dagle's night crew will begin installing traffic loops detectors at the intersection of Chapel Street, Chestnut Street & Great Plain Ave also at the intersection of Great Plain Ave, Dedham Ave and Highland Ave.
August 25, 2017 - Week 58: On Monday, MDR installed the weir in the drain manhole located in the intersection of GPA and Highland Ave. MDR's landscape subcontractor was in several times this past week to water the trees and plants. Lidell Inc. installed the traffic and street signs in the Downtown area (there are 2 more signs remaining to be installed by Lidell). Eversource was on-site to disconnect the power to the old light poles and to install power to the Chapel Street power cabinet. Currently, MDR is coordinating the milling and paving schedule and they are also trying to schedule removal of the old light poles. August 18, 2017 - Week 57: MDR installed trash barrels along the street and wooden bench seats on the planters. 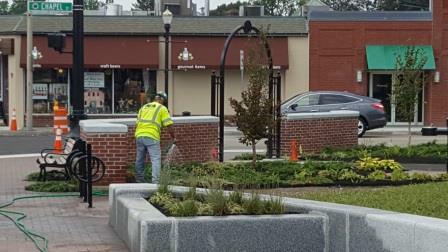 The contractor also paved a portion of Highland Ave in front of the driveway entrance aside Santander Bank, poured the concrete sidewalk around planter “B” and installed the sidewalk pavers around planter “B”. 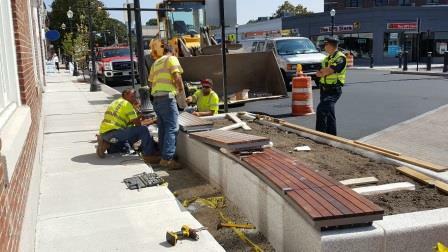 In addition, MDR had their landscape subcontractor on site this past week to install trees in the tree grates along the street and landscape plants. 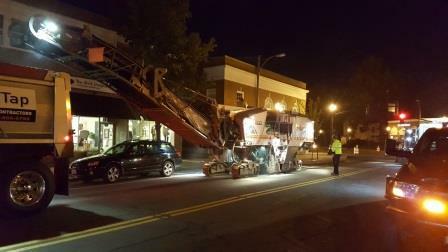 Next week, MDR has scheduled milling and paving of the streets downtown, this will be performed during the night. August 11, 2017 - Week 56: MDR had two crews working downtown this past week, a daytime crew and a night crew. Both crews worked at the intersection of Chestnut Street and GPA. They completed Phase 4 of the intersection work. 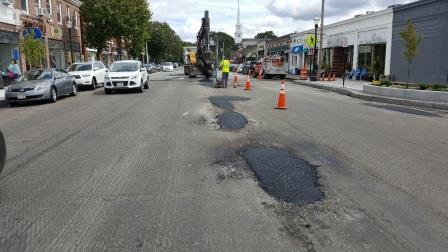 Phase 4 consisted of the south half of GPA at Chestnut Street intersection. The crew performed a full depth excavation of this area, back-filled with gravel, installed granite curb, adjusted castings, placed the asphalt sub-base and sand base then installed the brick pavers. 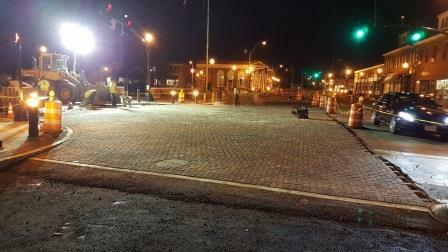 Both brick paver intersections were open to traffic this week as MDR completed this portion of work. MDR also removed the detour signs from the local streets. 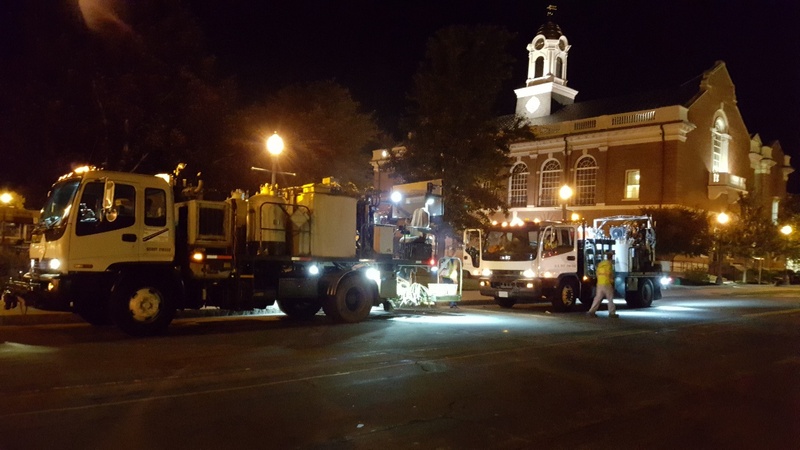 August 4, 2017 - Week 55: MDR had two crews working downtown this past week, a daytime crew and a night crew. Both crews worked at the intersection of Chapel Street and GPA. 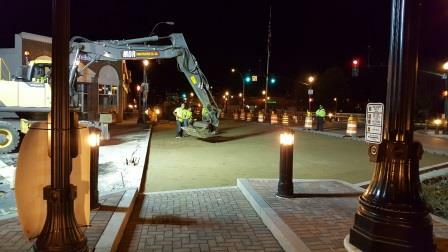 Phase 3 intersection work consisted of the north half of GPA at Chapel Street intersection. The crew performed a full depth excavation of this area, back-filled with gravel, installed granite curb, adjusted castings, placed the asphalt sub-base and sand base then installed brick pavers. 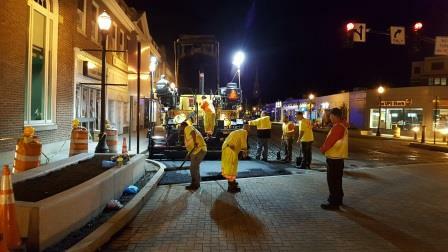 July 28, 2017 - Week 54: MDR had two crews working Downtown this past week, a daytime crew and a night crew. 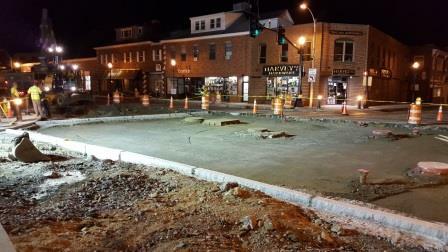 This week's work zone was at the intersection of Dedham Ave and Great Plain Ave. The crews performed a full depth excavation of this area, back-filled with gravel, installed granite curbing, placed the asphalt sub-base and sand base then installed the brick pavers. 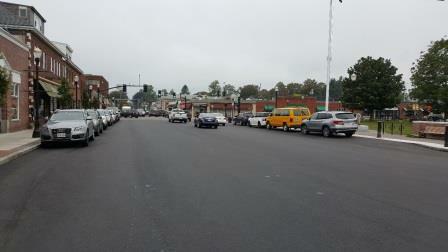 Next week, MDR plans to begin work on phase three of the intersection work. 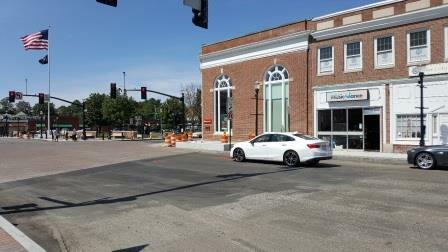 Phase three consists of closing the north half of GPA at Chapel Street intersection to perform the work necessary to install brick pavers. July 21, 2017 Week 53: Sunday night, the crew set up detours and installed curb crosswalk limits. Monday’s daytime crew stripped the pavement from the crosswalk area. The evening crew excavated the crosswalk area, installed base material and stripped pavement from the Highland Avenue approach. 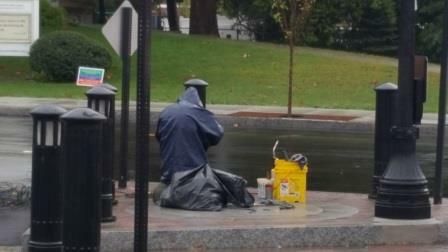 Tuesday’s daytime crew raised castings within the crosswalk area and paved the crosswalk. 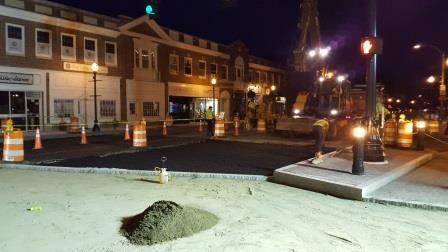 The evening crew excavated and roughed the Highland Avenue approach, excavated the west approach on Great Plain Avenue and partially paved the crosswalk area. Wednesday’s daytime crew completed the binder within the crosswalk, installed weep holes, started spreading sand, and setting brick pavers. 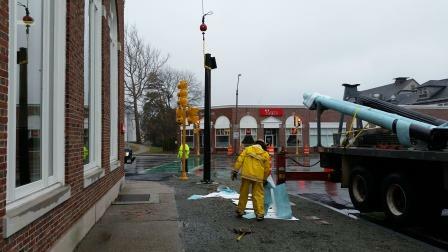 Additionally, the electric manhole was adjusted to grade by Eversource. 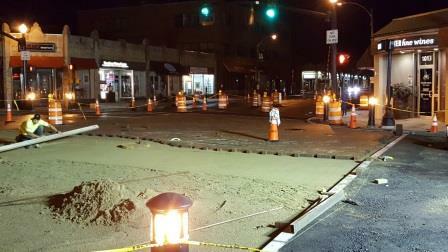 The evening crew spread sand across the remainder of the crosswalk area, excavated, and graded both approaches on Great Plain Avenue. 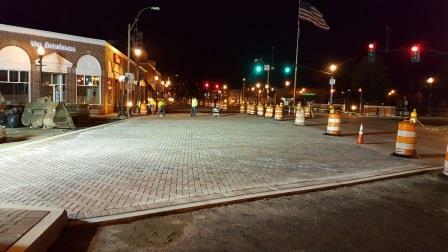 Thursday’s daytime and evening crews continued laying bricks throughout the crosswalk area. 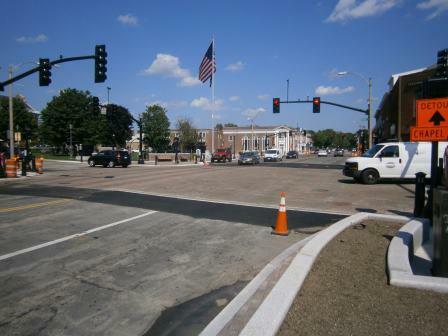 The daytime crew plans to pave the approaches to the crosswalk on Friday and install the soldier bricks along the edges and the remainder of the brickwork. July 14, 2017 Week 52: The contractor continued to pour sidewalks in front of Sweet Basil's and two patches near Town Hall. 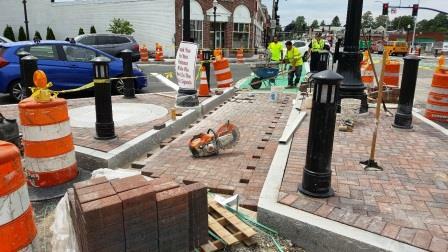 The crosswalk to the island at Dedham Avenue were excavated, granite was installed and pavers were set. An excavation was done to make the electrical connection to the newly installed vault. 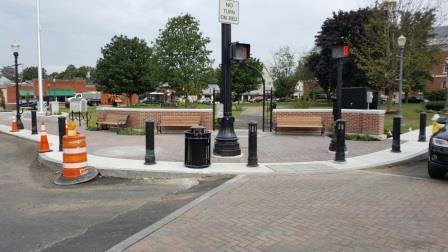 In addition to the work shown in the pictures, bicycle racks were installed at the Common and along Great Plain Avenue. Next week, the intersection of Highland Avenue and Great Plain Avenue will be constructed. 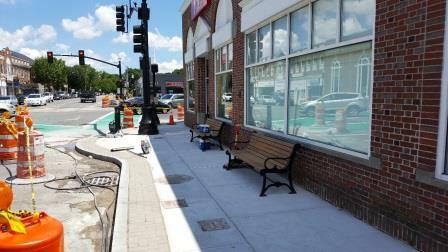 July 7, 2017 Week 51: MDR poured sidewalks throughout the Downtown, specifically in front of Harvey’s entrance, in front of Sweet Basil, the base for the ramp in front of the UPS Store, and the base for the ramp in front of Santander bank. MDR continued laying bricks along the north side of Great Plain Avenue near Highland Avenue in front of the sidewalk. 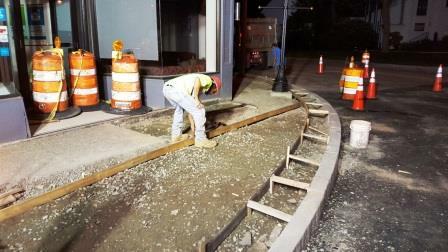 The contractor also excavated to install a highway sign base near the UPS Store. 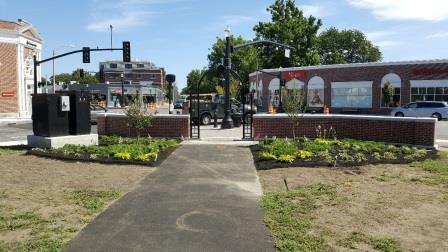 June 30, 2017 Week 50: MDR worked on framing and pouring the concrete sidewalks, installed brick pavers in the crosswalk at the island on Dedham Ave., installed some benches on the Common and on the sidewalks, removed the protective fencing on the Common, installed the tree grates on a temporary basis and erected the new flagpole in the Town Common. 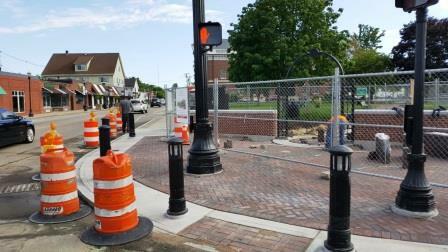 Next week, MDR plans to continue working on the sidewalks and brick pavers along the curbing. June 23, 2017 Week 49: MDR had two crews working this past week. The day crew worked on framing and pouring the concrete sidewalks. 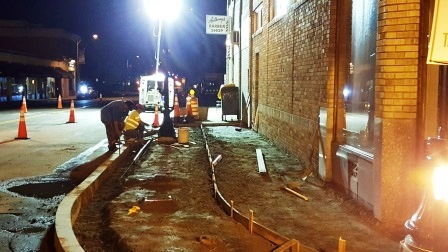 The night crew worked on excavating the old concrete sidewalks, placing the sub base and fine grading the sub base under the sidewalks, as well as forming the sidewalks in preparation for concrete. 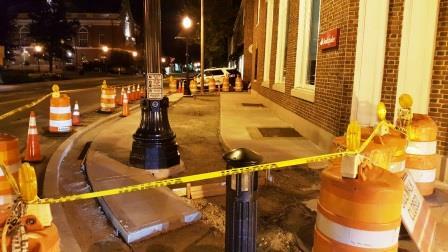 Next week, MDR plans to continue working on the sidewalks, including the handicap ramps at intersections. MDR will continue to communicate with the businesses and perform the sidewalk work that is timely for each establishment, especially at the entrances. June 16, 2017 Week 48: MDR had two crews working downtown this week. 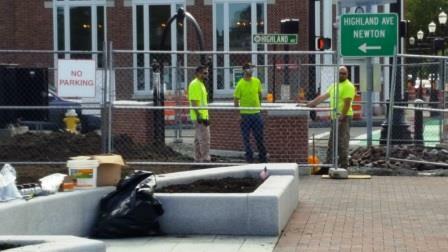 The day crew worked on the Common walkway area at the intersection of GPA and Highland Ave., paving the walkway in the Common, pouring concrete sidewalks, installing brick pavers, and installing granite planters downtown. 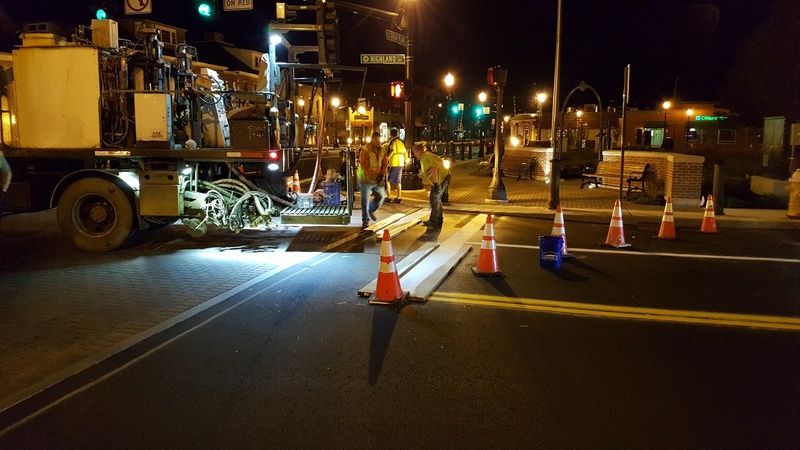 The night crew worked on excavating portions of Dedham Ave. and Highland Ave. for full depth excavation, backfill, and pavement. They also excavated and installed all the structural fill along the curb per plan and began excavating the concrete sidewalk, backfilling, and setting forms for concrete sidewalk to be poured. Next week, the night crew plans to excavate the concrete sidewalk in front of Hearth Pizza and in front of CVS, backfill, and set forms for concrete. The day crew will then pour the concrete sidewalk in this area. MDR has discussed this work and time frame with these two businesses. MDR will continue to communicate with the businesses and perform the sidewalk work that is timely for each establishment, especially at the entrances. The remainder of the week MDR will excavate and replace sidewalk in areas that do not affect business entrances. June 9, 2017 Week 47: Two MDR crews worked Downtown this past week. The day crew worked on the walkway area at the intersection of GPA and Highland Ave., preparing the area for brick pavers. 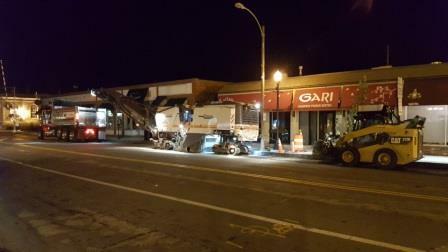 The night crew worked on resetting granite curbing in front of the UPS store and along the south side of GPA between CVS and Harvey’s, the crew also excavated along the curb on GPA for the full depth excavation in preparation of paving GPA. Next week they plan to set brick pavers near the intersection of GPA and Highland Ave. and excavate for placement of the sidewalk structural fill. MDR will continue with a day and night crew next week. June 2, 2017 Week 46: MDR’s sub contractor worked at the site this past week. Dagle Electric installed more wires in the conduits. 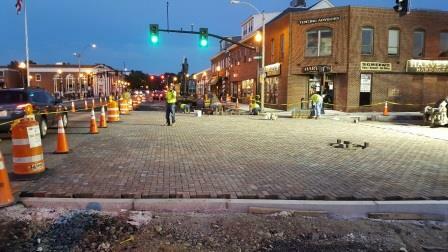 The brick pavers were installed in the Common. Next week, more of the same work is planned to be performed on the Highland Avenue side and a second MDR crew plans to begin working nights on the curbing and sidewalk. May 26, 2017 Week 45: MDR installed granite walkway block, the self watering systems within the granite planters, and placed loam along the back side of the wall adjacent to the walkway. Subcontractors installed brick pavers, completed the granite cap on the wall, and acid washed the brick walls. Next week they plan to perform more of the same work. May 19, 2017 Week 44: This past week, MDR built forms for concrete walkways, poured concrete, installed granite walkway block, and installed the compass rose in the Town Common. Next week, MDR plans to perform more of the same work. 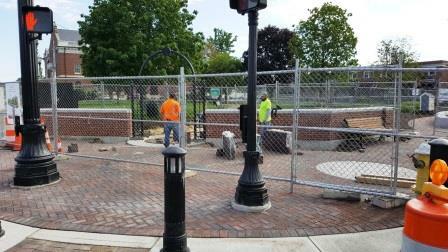 Also, the temporary flag pole and brick pavers are scheduled to be installed next week. May 12, 2017 Week 43: Dagle Electric was at the site this past week and spliced wires, connected ground wires, and installed the DVR in the Town Hall. MDR was also at the site this past week constructing the granite seat wall and pouring a concrete slab in front of the newly constructed walls. Both contractors expect to continue performing more of the same work next week. May 5, 2017 Week 42: This past week, concrete was poured within the new walls, MDR and the masons drilled into the wall to install the cap on top, and the columns on either side of the flagpole were put into place. 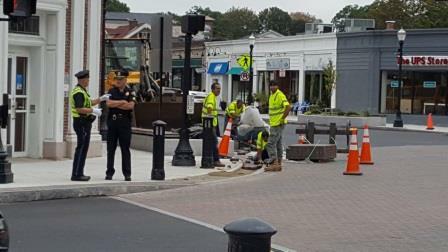 Starting next week, MDR intends to grade the sidewalk and handicap ramp areas along the Common from the new wall on Chapel Street to beyond the flagpole on Great Plain Avenue for the installation of the concrete paver base. In order to do this work, the Chapel Street sidewalk will be closed south of the bus stop and around the corner to Great Plain Avenue, along the Common side. MDR will be providing signs for the pedestrian traffic. April 28, 2017 Week 41: MDR excavated for the flagpole base, masons worked on the wall, and electricians worked inside of the electrical box near Highland Avenue. The flagpole base was poured on Wednesday. The banner arms were set on the pedestrian light poles. In addition to the work shown in these photos, the luminaries at the top of the mast arm poles were set, the volume of pedestrian crossing sounds was increased, the base to a kiosk was poured, and the water fountain location was excavated. April 21, 2017 Week 40: Dagle Electric spliced wires to lighted bollards and light poles, C & D Masonry constructed the masonry walls in the Common, and MDR installed a handhole near Town Hall for installation of fiber optics cable. Dagle Electric and C& D Masonry expect to return next week to continue performing work of a similar nature. April 14, 2017 Week 39: Dagle Electric installed light poles and bollards throughout the Downtown. 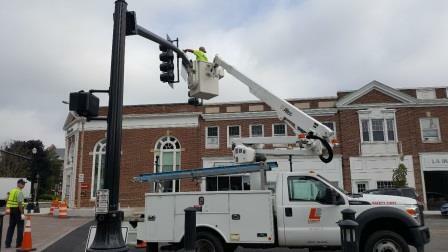 Light poles were installed on Great Plain Avenue, on Highland Avenue, and on Great Plain Avenue along the Common. 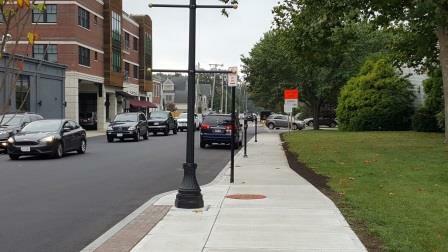 A bollard was installed at the intersection of Chapel Street and Great Plain Avenue. The walls along the Common were not attempted this week, and may be attempted next week. April 7, 2017 Week 38: MDR excavated the conduit trench to the electrical manhole in Great Plain Avenue and Highland Avenue. 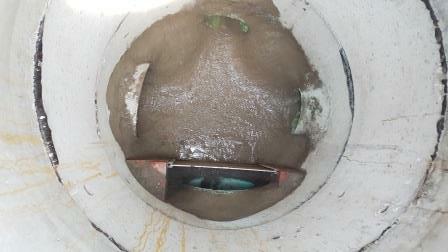 Eversource brought the conduit into the manhole and Dagle wired it. Eversource will connect it. 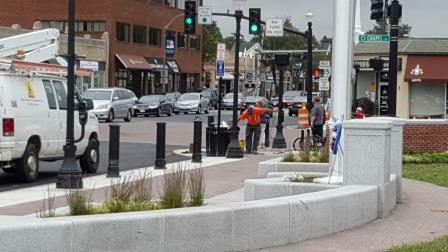 The pedestrian light pole was installed on Great Plain Avenue. 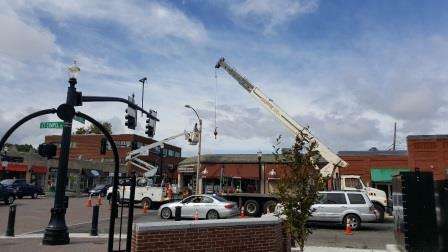 Along Dedham Avenue, a pedestrian light and two other light poles have been installed. Granite and bricks, for the walls and details around the Common, were delivered. The walls along the Common are scheduled to be constructed next week. March 31, 2017 Week 37: The new lights for Highland Avenue have been activated. The old light posts were dismantled and removed. 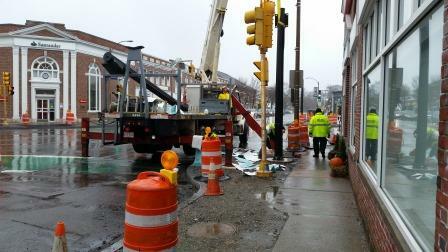 The old light poles and fixtures were dismantled on Great Plain Avenue at Chapel Street. The new lights in the Chapel Street, Chestnut Street and Great Plain Avenue intersection are active and the old lights were removed. The camera on the mast arm in front of Santander bank was also installed. 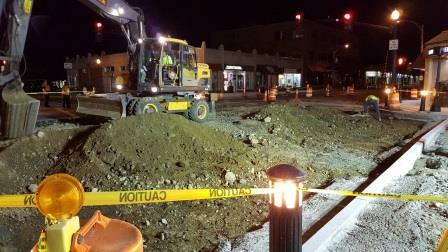 The street light crew continued to pull wires for the bollards and pedestrian lighting. The Opticom system for emergency vehicles was installed. Dagle plans to synchronize the railroad traffic lights with the railroad Friday, weather permitting. March 24, 2017 Week 36: Dagle Electric installed push buttons on the traffic signal posts, pulled wires through the conduits and continued splicing wires. Next week, Dagle Electric expects to install the mast arm cameras and wiring, as well as the fiber optic wiring into Town Hall and activate the new traffic signals. MDR installed most of the bollards this past week. March 17, 2017 Week 35: Dagle Electric installed Opticon sensors and beacons on the traffic mast arms, spliced wires and installed metal skirts on the traffic poles. They expect to install the mast arm cameras and wiring for the cameras next week. March 10, 2017 Week 34: Dagle Electric continued installing traffic mast arms and two power cabinets on the concrete pads in the common. They had two crews on site this week. MDR installed a conduit from a handhole to a power cabinet located adjacent to the railroad tracks on Great Plain Avenue. Dagle Electric expects to be in next week to continue working with the wiring and to install mast arms, posts and bollards. March 3, 2017 Week 33: Dagle Electric was pulling wires through conduits and splicing the wires in handholes and at traffic signals. They also delivered materials including posts, bollards, cabinets and lighting supplies to the storage area. Dagle Electric expects to be in next week to continue working with the wiring and to install mast arms, posts and bollards. February 24, 2017 Week 32: This week MDR’s crew did not work at the site. 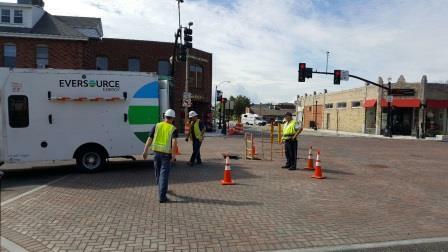 Dagle Electric installed the remaining traffic signal posts and wires in the conduits. CD Masonry also constructed the mock-ups of the brick wall and pavers. 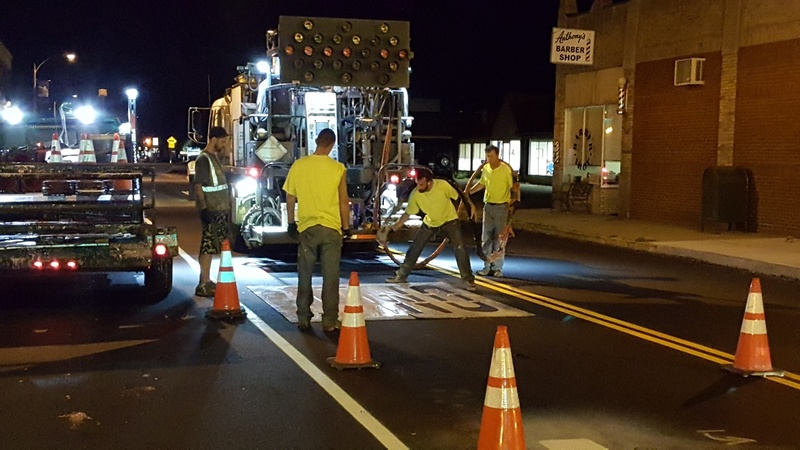 Temporary pavement markings were painted on the two intersections and along Great Plain Ave. consisting of double yellow centerline, lane lines, crosswalks, stop bars and parking stalls. Dagle Electric expects to be in next week to continue installing wires in conduit and to install the traffic signal mast arms. February 17, 2017 Week 31: This week Dagle Electric installed hardware on the pedestrian posts. MDR’s crew did not work at the site due to inclement weather. Both expect to be in next week, weather permitting. February 10, 2017 Week 30: This week the contractor installed electrical conduit and the remaining 6 bollards in the common along Great Plain Ave., excavated and back-filled within the common for placement of brickwork and removal of the tulip tree stump. Two work days were lost this week due to weather. Next week the contractor plans to continue installing conduit and preparing sub base for brickwork, weather permitting. February 3, 2017 Week 29: This week the contractor was at the site to back-fill around the decorative walls on the common, remove the tulip tree, remove the flagpole and concrete base, and install conduit within the common. Next week they plan to continue installing conduit, weather permitting. January 27, 2017 Week 28: This week the contractor was at the site to install the decorative walls on the common. 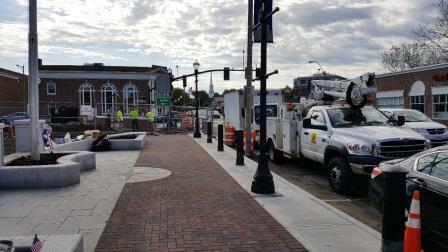 They poured the concrete walls on the common and installed the pedestrian posts located at crosswalks. Next week they plan to continue work on the wall construction, weather permitting. January 20, 2017 Week 27: This week the contractor was at the site to excavate for the decorative walls to be constructed in the common. This week they excavated for the footings on the east and west walls, formed the footings, installed the reinforcing steel and poured the concrete footings. The pictures show the area being excavated and the footings constructed, there is also a picture of the metal archways which were delivered this week. Next week they plan to continue work on the wall construction, weather permitting. January 13, 2017 Week 26: This week a subcontractor was at the site to relocate traffic control cabinets on Chapel St. and Highland Ave. These cabinets will be replaced at a later date. 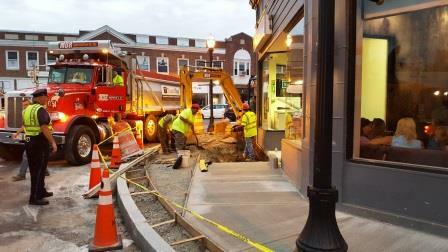 The cabinets were relocated so that the contractor can begin excavation for the decorative wall on the Town Common. This work could possibly begin as soon as next week, weather permitting. January 6, 2017 Week 25: This week 6 mast arm posts were installed.